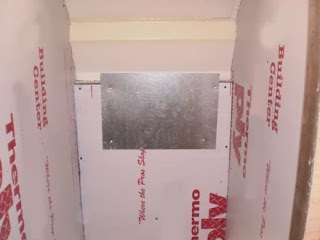 I started today by putting Styrofoam insulation in the stud walls where the fridge will go. 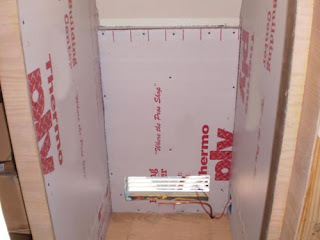 This needs to be insulated because it will be exposed to the outside air (this whole enclosure is vented) and I did not want heat or cold seeping through the walls. 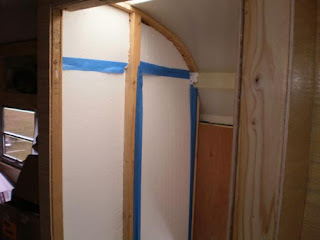 Next, I paneled the walls with ThermoPly. The refrigerator emits a lot of heat so I screwed in a piece of sheet metal that will act as a heat shield. Then I sealed every seem with silicone. 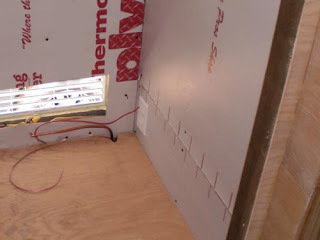 Next, I wired the 120v plug in place. The red wire is used when the fridge will run on 12 volt power, the gas line is for gas applications and the 120v for when I am hooked up to power.